As a young Marketing Director of British Telecom Enterprises, my brief was to pioneer independent online premium-rate ‘virtual’ brands. Internet was not heard of at the time! 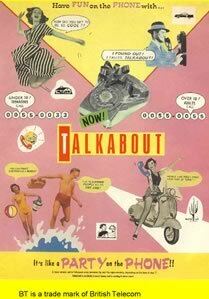 Talkabout was BT Enterprises’ first major success and had people meeting and chatting on-line for hours and hours. Never before had a premium rate telephone number created such a buzz and been so well branded. All of the UK was talking about it! Hundreds of call centres were set up nationwide to monitor content. The problem was that teens were running up their parents’ phone bills and staff were doing the same from work! This success was quickly followed through with LiveWire – a branded premium-rate pay-on-demand pop radio station on the phone. Then Starcall and then Tarot Call. Phones went wild! Then came internet…..phone number brands become web-brands or dissappeared.